The offshore providers, which rarely interacted above director level and did the low end lift and shift routine work. The integrators, which worked primarily with the IT and operations leadership to do the higher end work the ERP integration, often overseeing some of the offshore service providers to make sure they were doing their job. Then the likes of Accenture, IBM and Capgemini realized the offshore firms had eaten their lunch and they rolled out their own offshore delivery functions in 2005-2010 to circumvent the heavy flow of dollars to the Indian-centric majors. Accenture and IBM managed to catch up and compete on price when they needed to, while Capgemini really needed to acquire IGATE last year to be more effective as an offshore provider, in addition to being an integrator. Meanwhile, you had the likes of Deloitte, PwC and E&Y, which chose to stay out of the offshore game and sell integration capabilities as consultants, rather than managed service outsourcers. The losers in all of this were the traditional IT/BPO services providers, such as HP(EDS), CSC, Xerox(ACS) et al whose lunch was eaten by the offshore providers, struggling to compete on price, scale and flexibility. So what are these two emerging groups of service provider? 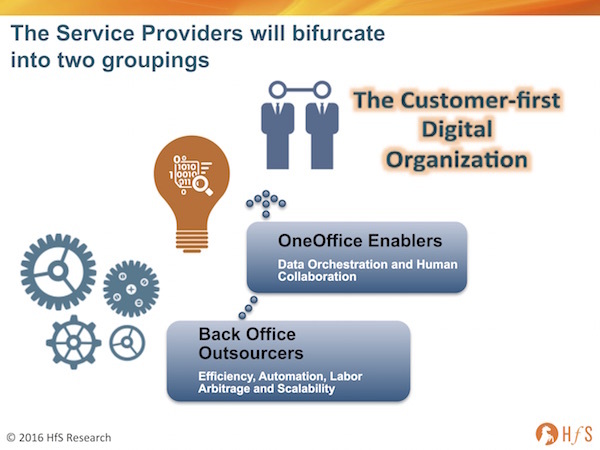 OneOffice Enablers - focused on designing and enabling the digital customer experience and tying the front to the back to make it all happen (see below). This is where I also see the bigger plays around cognitive happening. 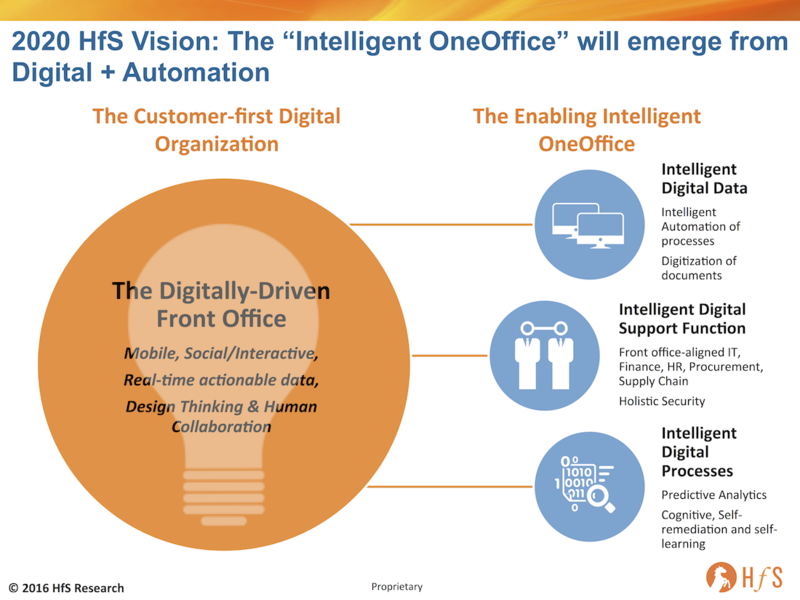 Lots more project-based deals for the Deloittes, Accentures, IBMs, KPMGs and emerging players, like Cognizant, which are moving up the value chain and developing deep specialization is various areas of the OneOffice environment (see below). We'll also see several small consultants emerge in this space with industry specialization. Back Office Outsourcers - focused on efficiency, automation, arbitrate and scalability. This is where the many of the current crop of offshore-centric and legacy outsourcers will likely end up if they fail to make the right investments... they will push hard to be in the "OneOffice” category, make a lot of the right noises, but the lion's share of their business will be in this group. Back-end IT providers failing to invest in real domain expertise will always be in the feature and functionality game. Automating incident response, some systems management and help desk querying is probably about the limit to where they can do – but that’s OK, there is a market for cheap IT support and services. There’s a market for cheap call center work, for cheap collections and cheap claims processing support… it’s just going to get a little smaller and more automated. This is all about who can develop intelligent data practices based on automation, digital and cognitive which are tied to industrialized solutions, horizontals such as F&A, HR, procurement, or verticals like retail, healthcare, insurance etc. Who can work with clients who generally can understand their businesses, apply their challenges to their industries, and forge solutions that keep them viable in disruptive markets. Ultimately, this is about pulling data from the market and the customer and building a platform at the back end that aligns it to the business. The great variable is the human element to evolve to make this really happen (or resist it and watch the companies wither and die). Technology is moving at warp speed, while talent is not - that is the great digital quagmire enterprise clients need to solve, if they are to be successful down the road. We are approaching a talent crunch of seismic proportions, possibly more destructive than the industrial revolution, because then people were displaced into new industries that needed people to build them…. now they are being displaced by computers. So let’s stop kidding ourselves, the future isn’t looking as pretty for employment growth as the last 20 years, so the need to focus and be great and delivering what we are capable of is key. If you do great DumbOffice, then focus on DumbOffice – there’s a market for that and it’s not going away anytime soon, but if you have the ability to evolve and keep your talent aligned with the unraveling digital customer, there is real opportunity in the OneOffice world. 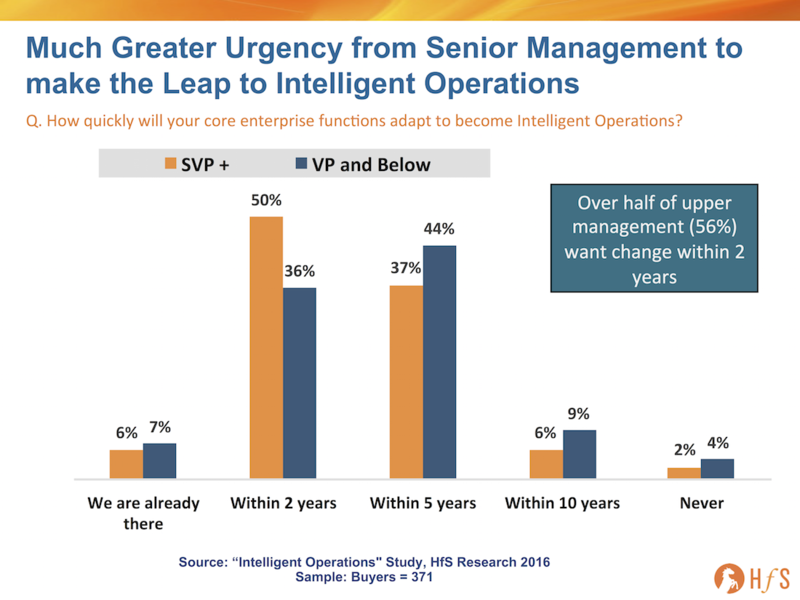 In a nutshell, increased complexity is demanding increased expertise at the front office of the business, which, in turn, is demanding the back end to respond with more automated, scalable, seamless enablement capability. Faster, cheaper, smarter are the watchwords for OneOffice services now… building on the faster, cheaper, better from yesterday’s world. Phil - I like how to compare the old bifurcation with what is happening now. Very similar, but the stakes are higher as are the expectations. Why do you think many of the service providers will fail with OneOffice? Good description of why many traditional providers have fallen away in recent years. Do you see them coming back with these emerging expertise needs? Or is this a race to the bottom, in your view? Phil, great commentary, and absolutely what we are seeing in the market now on both the supply and buy sides. Phil, Enjoyed reading! Do you have a point of view on providers like Publicis who have acquired Sapient, Razorfish and the likes? Very strong and pertinent article !!! Interesting read and about time companies make OneOffice their vision for the future. The back office is already crumbling with Self-service playing a larger role in completing processes. Rapid ch ages taking place in the role of customer service reps sitting in the back-offices.